As we continue to trudge through this unseasonably cold spring up here in Minnesota, a holiday that I have never really appreciated was celebrated today. 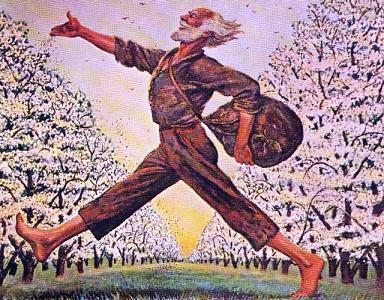 Arbor day, a day to plant and take care of trees, was conceived by J. Sterling Morton in 1872. Morton was a respected patriot and agriculturalist who served under President Cleveland as Secretary of Agriculture, transforming that department into an aid and information resource for farmers. That first Arbor day, celebrated on April 10, 1872, over 1 million trees were planted. That tradition continues today with cities and states holding their own Arbor Day events. This morning we attended the W. St. Paul Arbor Day tree planting at Harmon park (also where our first community garden will be) and planted a Prairie Fire crabapple tree. There were hotdogs and lemonade, pamphlets about the emerald ash borer and a raffle drawing for trees. 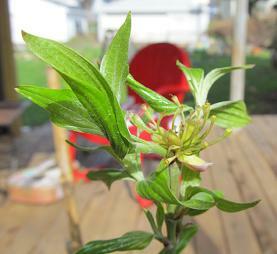 We ended up winning one of the trees and took home our own Prairie Fire crabapple and planted it this afternoon. I am super excited about this tree. Crabapples are great pollinators for other apple trees (which we already have a lot of , and are getting more), and they are absolutely beautiful. Another thing about crabapples that a lot of people are not aware of is their culinary uses. Crabapples can be made into relishes and other preserves, but they are also a traditional and important apple variety used in the making of hard cider. A pretty close-up of a Cornelian Cherry! Another surprise today was waiting on our front stoop when we got home, our two Cornelian Cherries showed up. Cornus Mas, an edible form of dogwood has a long history stretching back all the way to the Romans. The wood is prized for tool handles and the berries have been used throughout eastern Europe, the Balkans and parts of the middle east for wines, preserves, desserts, and as a dried, salted snack. The cornelian cherry needs two varieties for proper pollination so we purchased one called Red Star and another called Yellow fruit. They will grow anywhere from 10-15 feet and will produce fruit for years to come. They are a welcome addition to the north edge of our flower and herb garden, and serve as a great upper story in a permaculture guild. For more information about cornelian cherries, here is a great article I found last winter that is a great read and may make you want to grow some for yourself. 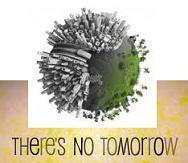 In a perfect world Arbor day would be everyday. I love trees – the inspiration they give to poets, the air they give us to breathe, the fruits that nourish us, and the lumber that keeps us warm and dry, trees are essential to human survival. This past winter, with the help of two of my nephews, I cut down about ten trees in our new lot. 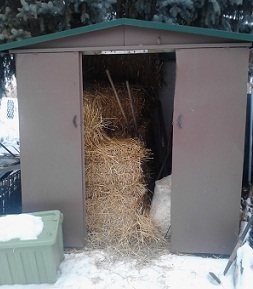 This is something that I did with a heavy heart, but in the long run it is a good thing (the wood will be heating my house in two winters, and we have a ton of wood chips now!). The lot we purchased last summer was overgrown with buckthorn, Chinese Elm, and volunteer spruce trees. All of these trees have made our back garden less then optimal so they had to go. I have made it my goal to replace every tree I cut down with a new one. 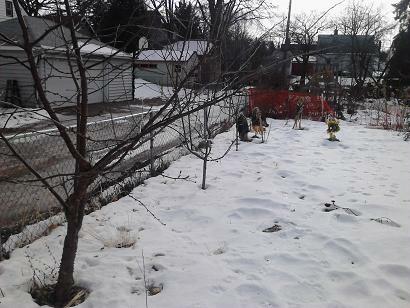 So far I have planted two Russian Rowans, The Prairie Fire crabapple, and the two Cornelian Cherries – five to go. Luckily I have one more apple tree, the Amere de Berthcourt, French cider apple on the way, and I will be grafting another 15 apple trees once the rootstock shows up in the mail. So by the end of the summer I should be good on my promise plus some. I hope to turn this passion for fruit trees into something awesome and epic, my plan is to start an urban nursery and orchard over the next few years. Not only do I want to grow fruit for my family and friends, I also want to provide high quality fruit trees for my community. And from now on I will be participating in Arbor day every year! Cheers! 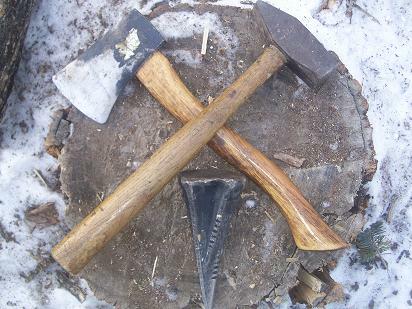 A hatchet, small sledge hammer, and pointed wedge all used for splitting wood. 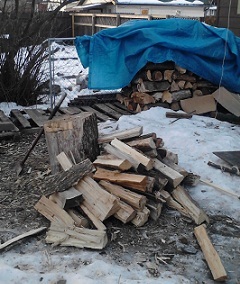 Splitting fire wood has become a regular winter chore for us here at Autonomy Acres. Like I said in a previous post, the majority of our home heat comes from our wood burning stove. My two favorite types of wood to burn and split are oak and maple. 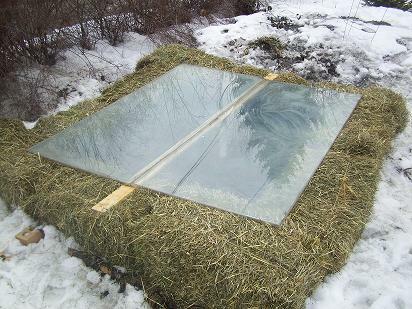 Both types are hard wood that burn long and hot which is great for heating a house. Elm is another very common species of tree found here in Minnesota. 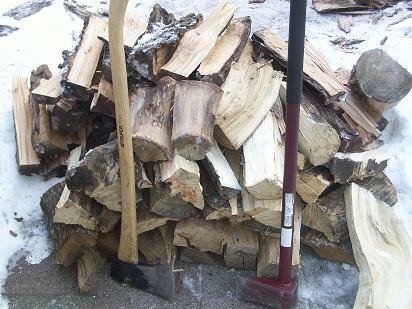 It is another hard wood that is great fuel for heating your house, but it is very hard to split by hand. 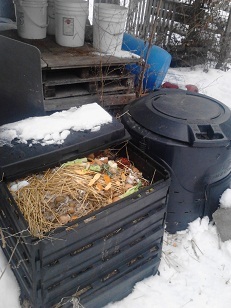 This pile was twice as big at the start of winter. Compared to oak and maple which are very straight-grained wood, elm is very knotty with a wavy flow of the grain. Due to the trees natural traits and disease that affect elms, it is a pretty easy wood to find for free off of peoples curbs at all times of the year. What I have found that makes splitting elm easier, is waiting until the coldest days of the year. Something about the extreme cold temps make splitting elm that much easier, the colder the better. For me this is a great thing. 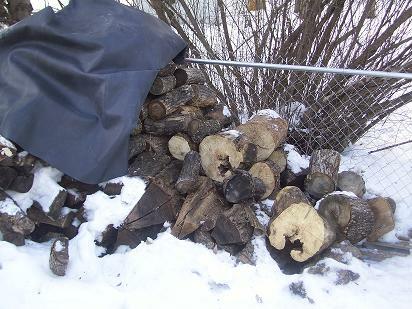 The cold days, the best ones for splitting wood, are almost always sunny. Being easily depressed from the long dark nights, getting out to chop wood on a sunny afternoon is a shot of good medicine. It is also good meditation and exercise, I always feel better after splitting a pile of wood. We have another few months of having to heat the house, so we will keep splitting wood and thinking warm thoughts of spring. A freshly chopped pile of Oak and Elm, also my axe and splitting maul.